Atmanand G Holeyannavar and Vinayak M BankapurHosmat Physiotherapy, Information, Data. G. Venkata Nagaiah and D. RavinderMultilingual library, Library sources, Library services, Sahitya Akademi Library, Special libraries. J. J. Thabah and Hirak Jyoti HazarikaInformation needs, Information seeking behavior, College teachers, Libraries, Internet, and Morigaon. Parameshappa. Kenchakaller and K S SavithaS Nijalingappa college, Library sources and services, Electronic Resources, Reference service, OPAC. Devendra Kumar, Abdul Quadir and Jamal Ahmad SiddiquiHuman resource management, College libraries, Library management, Library administration, Manpower in library. 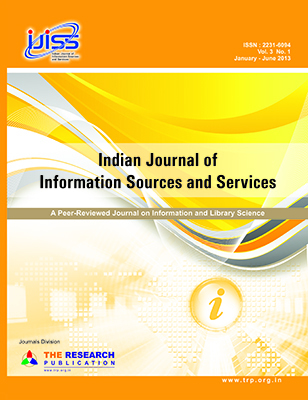 Dr.S.Parameshwar and Dr. Shankar Reddy KolleALIS, LISc, Citation Analysis, Publication Trends, Bibliometric, Authorship pattern, Geographical distribution. K.Ramesh and M.JayaprakashScientometrics, bibliometrics, open source library software. R. Senthilkumar and M. MuthukrishnanCitation, Citespace, Content analysis, Histcite, Most Productive Author, Oncology, Scientometric analysis. Funmilola O. OmotayoInformation, Communication, Technology, Use,Educated, Elderly. Rubina AnisElectronic Information, Assistive, Braille, Visually impaired, Screen reader, scanner, software. K. ThukaramCentral University Libraries, Information gathering, Information communication technology, Information seeking behavior, Library services, Library resources, Researchers and Questionnaires. R. Senthilkumar and G.UlaganathanBibliometrics, Bibliography, Citation analysis, Authorship pattern, Emerging Market Finance. A.Laxmana CharyIndoor air, fungal infections, bacteria, airborne fungi, toxic products, fungal diseases. S.Nattar, A.Duraisingam and D. AlexScientometrics, Distribution of Contributions, Geographical distribution, Indian Journal of Pure and Applied Physics. A.Duraisingam , S.Nattar and D. AlexInternet, e - book, Arul Anandar College, search engines, e-journals, rural girls. R.Anilkumar and K.C. Abdul MajeedInformation, information seeking behavior, eresources, speech and hearing impaired students, National Institute of Speech and Hearing Library, Physically handicapped students. K.Vijayakumar and ShuaibInformation Communication Technology, Awareness, Faculty, Physical Sciences, Tamil Nadu. C. Velmurugan and K. Ramakrishna ReddyInformation Retrieval, Search Engines, Engineering Colleges, Engineering Faculty, Information Search, and Information Search Strategy. K.S.ShivrajOnline courses, MOOC, Academic Libraries. Arvind Mittal and B.K. SharmaDigital Resources, Agriculture Universities of Himachal Pradesh, E-Resources, E-books, E-journals, E Databases. S.Srinivasa Raghavan and G.SivakumarBiometric, Fingerprint Alignment, Fingerprint Image Recognition, Fingerprint Verification, Image Enhancement, Minutia Extraction. Authors are requested to submit their papers electronically to [email protected]org.in with mentioning the journal title.